Review: 2014-10-03, the fight between Daniel Straus and Justin Wilcox gets three stars thanks to a good finish. Daniel Straus entered this fight with a professional mma record of 22-5-0 (36% finishing rate) and he is ranked as the No.14 featherweight in the world, he won the Bellator Fw title in his only fight of 2013, against Pat Curran (=Curran vs Straus 2 ) but on March 2014, in their third bout, he lost the belt (=Straus vs Curran 3). His opponent, Justin Wilcox, has an official record of 14-6-0 (29% finishing rate) and he entered as the No.61 lightweight, he suffered his last defeat at the end of 2013 when he faced Patricio Freire (=Freire vs Wilcox) but he came back to win in 2014 beating Jason Fischer. 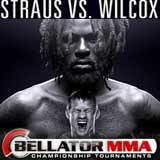 Straus vs Wilcox is the main event of Bellator 127. Watch the video and rate this fight!